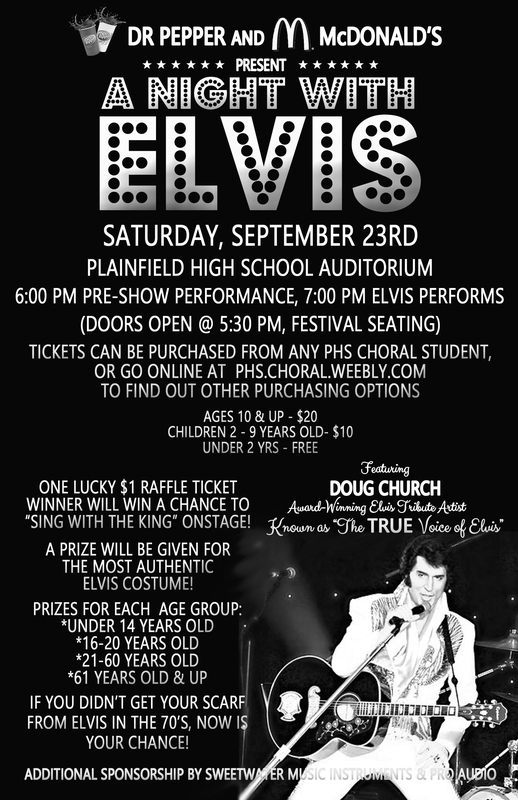 PHS Choral Boosters, with support from Dr Pepper and McDonald's, bring "The TRUE Voice of Elvis," Doug Church, to the Plainfield High School Auditorium! Tickets can be purchased from any PHS Choral student. Other purchasing opportunities: Home varsity football games on 8/11, 8/25 and 9/15, or Monday, Wednesday and Fridays in the PHS office, between noon and 1:00. And you can purchase your tickets the night of the event in the PHS Box Office. Questions? Call Jim Lautenschlager at 317-999-7940.